The Atlantic recliner by Ekornes Stressless is so incredibly popular. It is primarily due to its concise footprint and discreet cushioning. The model is a medium sized item which it not quite as high-backed at other Ekornes medium recliner chairs. Rather than be taller and less padded, it is slightly "stocky". At first glance, you cannot tell that the back and seat of this chair are incredibly cushioned. The Horizontal Comfort Zones™ divide the padding and support into the epicenters of each lumbar region. This ensures an even feel of support throughout the entire body. The adapting lumbar support and tilting ottoman will allow you recline and lay back while still receiving that positive body support that earned this brand an exclusive endorsment from the American Chiropractors' Association. 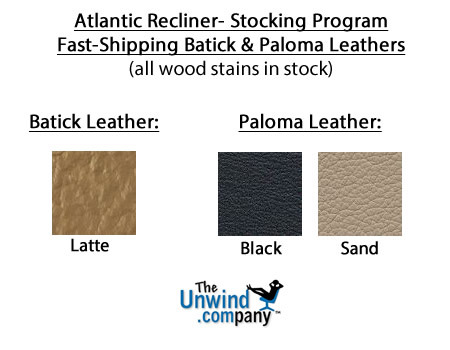 t is a fantastic time of year to purchase from the simplistic, comfortable, Stressless Atlantic, Pacific lineup! This comfortable Stressless recliner series insures consistent head, neck and back support and includes soft, understated cushioning. The Atlantic recliners allow you to sit without strain or sore muscles for many hours on end. Also, take a good look at the professional- inspired Atlantic office chair. With smooth, padded comfort sections and an elegant, simplistic stature, the Stressless Atlantic Recliner can ferry oceans of comfort into your living room and daily life. Your back, body (and wallet) will "thank you" everytime you "anchor in" to the supportive waters of what the Stressless Atlantic has to offer. Your satisfaction is 100% guaranteed. Like its slightly larger sibling (the large Stressless Pacific recliner, is a budget-conscious addition to the Stressless recliner lineup. The Atlantic recliner offers the Patented Plus System for constant comfort and is so stylish that it will feel "at home" in almost any room- Even the RV. Yet it still manages to bring home the same back and neck-saving features that Ekornes Stressless Recliners and chairs are famous for throughout the world! We invite you to sit down, kick-up your feet and take the Stressless Atlantic for a test-sail (or is that "sit")- You'll be glad you did! Come visit the Unwind Back & Body Store to experience the Ekornes Stressless Atlantic Recliner for yourself. It's always easiest to pick the perfect Stressless recliner if you have a chance to sit and relax in them for awhile. If you have already decided and are ready to purchase, simply click the "Add To Cart" button below after selecting from the available options. We will ship your chair assembled and you will not be charged for shipping in the contiguous United States (and much of North America). Please review our return policy prior to ordering or call 1-888-486-9463 or 1-601-932-5111 for personal assistance. You may also email stressless@unwind.com anytime- 24 hours a day, 7 days a week. We have many Stressless recliners in stock in multiple locations which allows us the ability to ship your recliner extremely fast and have it delivered quickly from coast to coast. The Unwind Company currently offers same-day delivery to almost 70 cities across the United States. Due to the time-sensitivity of our Unwind Express Delivery Service, we are currently unable to process these orders online. Please call 1-888-486-9463 and you can be enjoying your Stressless recliner much faster than you ever imagined. Of course there are some restrictions on this service and sadly, it is not available everywhere. Have a special shipping request? Give us a call, we might just surprise you! Not in that much of a hurry, or is your leather or fabric selection a special-order color? We offer many other full-service delivery options as well. The best part of our extensive delivery choices (aside from the great service) is that almost all are completely RISK FREE to our customers. A stress-free shopping experience is always our #1 goal! Add a beautiful matching Stressless Laptop Table, Ekornes Ellipse Table, or Swing Table and you might learn that the Stressless Atlantic is your most comfortable and productive place to work. Why not save fuel and reduce back and neck strain at the same time? After all, that's an economic stimulus plan that we all can feel better about (and it only takes a few hours to begin working). - Patented Plus System which provides continuous support for your head, neck and lower back. -Ekornes Stressless Recliners are created for a custom fit- Many of the Stressless recliners come in three sizes (small, medium or large) and many sofas are available in two sizes (medium or large). The Atlantic Recliner (medium) is comparable to the medium versions of the other Stressless recliner lines (Stressless Consul, Stressless Wing etc). Both the Stressless Atlantic and Stressless Pacific Recliners (medium and large) share the same attributes. For best results, take a seat and let us help you determine which size will ultimately offer the most comfort and correct support for your individual body size and weight. It is no surprise that Stressless Atlantic Recliners are Exclusively Endorsed by the American Chiropractic Association (the ACA). Have questions or need additional information about the medium Stressless Atlantic recliner or other Ekornes furniture? Please contact us at stressless@unwind.com or at 1-888-4-UNWIND (888-486-9463). We're here to assist you with your Stressless Atlantic or other Soothing Back Product or Furniture purchase.